Catarogo who is also a student of the school said such equipment would help in the development of players in Nadogo. He said there are promising players in the district and with such initiative it’s going to benefit Fiji FA in the long run. “We have hidden talents here so with proper guidance and coaching it will help us a lot,” he said. “We have a lot of players here who have the potential to represent Fiji like I did with the Fiji U17 side but lack of resources have been our downfall. They have skills and they have been playing from primary school and with the opening of the centre it will boost them more to develop themselves further. 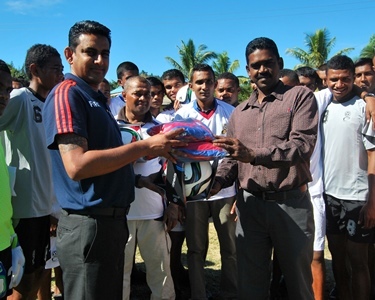 Catarogo said they are grateful to Fiji FA for such initiative to develop players in the countryside.